What makes BeatsAll the best grout cleaner? 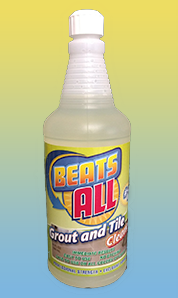 BeatsAll Grout & Tile cleaner works 5X faster than any other product on the market today. It is an acid based cleaner that has a special inhibitor which allows this incredible formula to be stronger and at the same time safe to use. BeatsAll is earth friendly and safe for our environment. The product has been engineered for maximum strength. It will not etch the tile and will restore the grout to its original color. To top it off, It is absolutely safe on ALL color grout. YOU will get powerful and astounding results, even on the most filthy grout. BeatsAll - Beats them all!